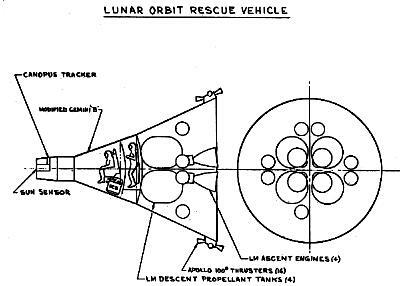 Gemini Lunar Orbit Rescue Vehicle, studied for rescue of an Apollo crew stranded in lunar orbit. Gemini would be launched by Saturn V. Following lunar orbit insertion it would rendezvous with the disabled Apollo. The three Apollo crew members would transfer by spacewalk to a compartment in the stretched Gemini capsule. It would then boost itself on a transearth trajectory. This was rejected in favour of the more flexible Gemini Lunar Surface Rescue Vehicle. American manned lunar orbiter. Study 1967. This version of Gemini was studied as a means of rescuing an Apollo CSM crew stranded in lunar orbit. The Gemini would be launched unmanned on a translunar trajectory by a Saturn V.
AKA: Gemini Lunar Orbit Rescue Vehicle;McDonnell-Douglas. Status: Study 1967. Thrust: 62.27 kN (13,999 lbf). Gross mass: 15,500 kg (34,100 lb). Unfuelled mass: 5,500 kg (12,100 lb). Specific impulse: 311 s. Height: 7.37 m (24.17 ft). 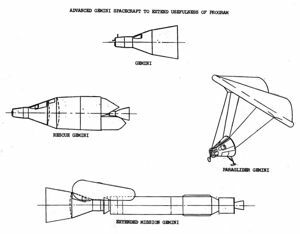 Following lunar orbit insertion it would automatically rendezvous with the disabled Apollo. The three Apollo crew members would transfer by a spacewalk to the passenger compartment of the stretched Gemini reentry module. It would then boost itself and the rescued crew to a transearth trajectory. This version was rejected in favor of the more flexible Gemini Lunar Surface Rescue Vehicle. In the wake of the Apollo fire, NASA reexamined many safety aspects of the Apollo project. The Apollo mission profile was inherently risky, and the likelihood of a crew being stranded in lunar orbit or on the lunar surface was relatively high. McDonnell returned to a concept first studied in 1962 - the use of Gemini as a Lunar Rescue Vehicle. Use of the Gemini B capsule, then in construction for use with the US Air Force's Manned Orbiting Laboratory, with various combinations of Apollo lunar module stations, would provide a rescue vehicle that could pick up Apollo astronauts stranded in lunar orbit or on the lunar surface. Three variant rescue schemes were studied, a Gemini Lunar Orbit Rescue Vehicle, Gemini Lunar Surface Survival Shelter and a Gemini Lunar Surface Rescue Spacecraft. Crew Size: 3. Habitable Volume: 5.00 m3. Spacecraft delta v: 3,100 m/s (10,100 ft/sec). Family: Lunar Orbiters, Moon. People: McDonnell. Country: USA. Spacecraft: Gemini LORV RM, Gemini LORV SM. Launch Vehicles: Saturn V. Propellants: N2O4/UDMH. Agency: NASA. Bibliography: 209. 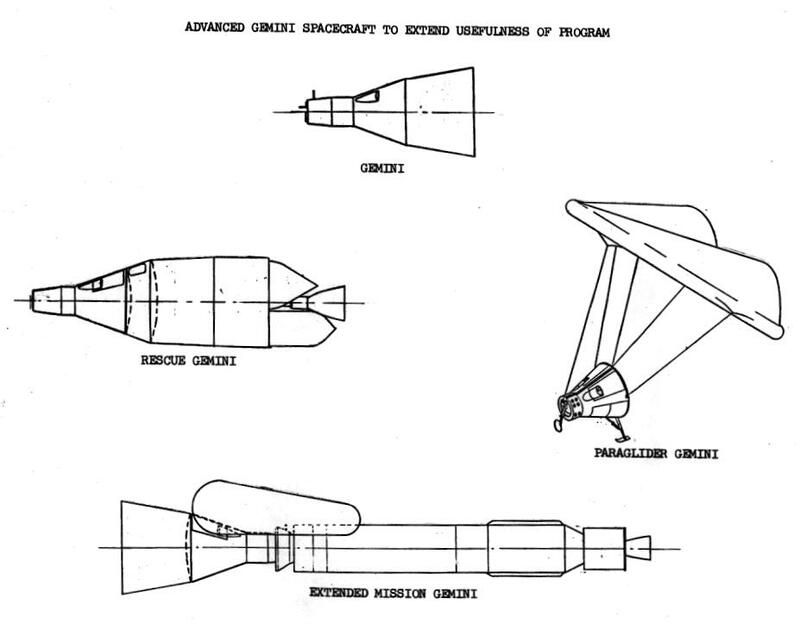 Modest modifications of Gemini proposed by McDonnell Douglas as a follow-on to the basic program (927 x 723 pixel version). Lunar Orbit Gemini. In this version a Gemini docks with a Titan 3C-launched transtage, which manoeuvres the Gemini into a lunar orbit and then returns it to earth.